I don’t know where she got it from but my Nan was a good yarner. Must have been her good bush breeding around open fires and kitchen tables. Nan would only spin to a sure audience and I could never get enough of it. Left alone, she would crochet. When the mouth didn’t, the hands still spun the yarn, in the patterns of her memory. We shared an intimacy of stories that carefully wove our lives together, like that of her crocheted ladies. There’s a story she told me only the once, of the night my grandfather died and how she knew when she woke that morning that he was gone. They were lovers before the war but she called it off when Dan went off to ‘The Front’. She told him, “Don’t write to me and I wont write to you. See you when you get back.” The while that he was away she knitted socks for unknown soldiers and rolled in little notes of love and hope for their return. Dan did return, rather surprisingly, with a swag of medals for his “acts of foolishness” as Nan called them, “Could have killed him many times over.” With more now than just a thread of hope for a life together she took up where she’d left off, seeing as he was still standing. They married and from all accounts did well to put the war behind them. Seven years later however, the war caught up with them. They hadn’t escaped after all; Dan’s lungs had been affected by ‘the gas’. Nan was balancing life between a dying husband in hospital, two very young children at home and a car in the driveway that she couldn’t bloody well drive. On this night, she dreamt a dream “not like any other dream”, I remember her telling me in a frustration of expression for it, just that it was “too real”. In the dream she’d woken from sleep to her husband calling to her from the back door. She’d gotten out of bed and gone to the door to find him standing there with a bunch of red roses. She urged him in but he wouldn’t come. He gave her the roses right through the door, giving her his “goodbyes” (she told me no more than this). She watched from behind the gauze, holding her roses as he went his way, again. When she woke in the real morning from that real sleep she expected to be still holding the roses. She said she knew, before the news came, that he had died before morning. The day after his funeral, Nan went straight to the police station and got herself a license to bloody well drive. Always picking up the threads, stitching everything together and getting on with things as best she knew how. After my Nan passed away herself in her sleep many years later, arrangements were being made for her funeral. Her daughter, my aunty, said Nan had told her, ”When you bury me just put a simple bunch of roses on my coffin.” I didn’t ask if anyone knew why. 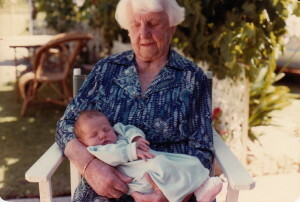 I was the youngest grandchild, what would I know? But I knew why and I just kept it as one of our secrets. I know this story and more because I always searched for them and I was always open to them. I loved visiting Nan when no one else was around. Alone with her she’d treat me more as a trusted friend and less as her youngest grandchild. Drinking tea, I’d ask her to tell me again over and over, the stories that I was allowed to. They were wonderful places to go for both of us and I always hoped that with each round of story I’d be trusted with just a little bit more of it, or better still, I’d trigger a new story from her memory. She’d ask me with the rarest of her smiles, getting my own little teapot from the pantry, “You like your tea, don’t you?” Still do, but she knew, it was what went with it that I really liked. “I’ve told you that before.” I’d give her a careful nudge, most times you had to. “I know, but I forget bits. Tell me again?” She had to believe that you really did want to hear her repeat herself. Nan wasn’t one to be made to look foolish. Her yarn for this was that for three nights in a row she dreamt hearing the gate to her driveway open and someone walking up the gravel drive to her bedroom window. Scratching on the gauze, a voice would say, “May, wake up, Dads gone.” Nan would wake up on each of these three mornings shocked and then relieved to realise she’d only been dreaming. But on the fourth night she was woken from her sleep to the very real sound of the gate to her driveway opening. Someone did walk up the gravel drive, came to her bedroom window and scratched on the gauze. “May, wake up, Dads gone.” It was her brother Wal. Their father had died. Unlike many of her other stories to me of ghosts and secrets, this one really had me curious, the answers weren’t in the story. How had the knowledge of an incident of the future come forward to her over three consecutive nights? I began to wonder about my own dreams and what they might be telling me. Sometimes when I am falling asleep, I hear a voice I don’t know call my name. I take it to look out for something that’s coming and just to be ready.